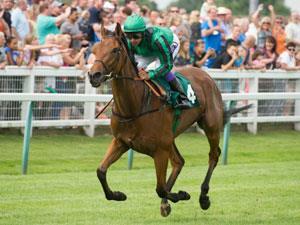 Great Yarmouth Racecourse invites you to join them for an evening at the races. Whether it’s a get together with friends, an excuse to get dressed up, or time to be enjoyed together as a family, there’s something for everyone and with 23 fixtures in 2019 there’s sure to be a date to fit your calendar. Arrive in plenty of time before the first race to beat the queues and grab a refreshing drink. This is also a good time to collect your raceday programme from the kiosk close to the turnstiles, giving you all the information about the runners and riders during the meeting as well as top tips for picking your fancy. About 20 minutes before each race the horses go into the parade ring where you can see if your fancy is looking geared up for a win. You’ll then have plenty of time to place your bet and pick a good spot to watch all the action! Finally, (and most importantly) enjoy yourself! Soak up the buzz of anticipation and excitement which builds before each race and experience the excitement of the crowd cheering in their winners. Families are always welcome with accompanied under 18's entering for free and our hospitality is second to none, you’ll be spoilt for choice with our range of bars and dining options. Great Yarmouth Racecourse looks forward to seeing you soon. A large open racecourse estate with 3 grandstands, 1 restaurant, fast food outlets, 6 public bars, picnic area, raceday hospitality for 600 and a children's playground. Prices vary depending on fixture and seating location. Please contact directly for pricing options. Under 18's are admitted free to all enclosures when accompanied by an adult. Please contact Great Yarmouth Racecourse directly for race times. The main access roads into Great Yarmouth are the A47 and A12. Follow the Racecourse signs to the North of the town. First Bus run services which stop within a few minutes walk from the racecourse. Vauxhall is the nearest railway station and is approx a 15 minute taxi ride.